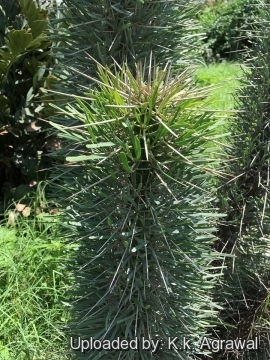 This is the most attractive member of the genus, a densely spiny silvery columns with strip-like leaves. 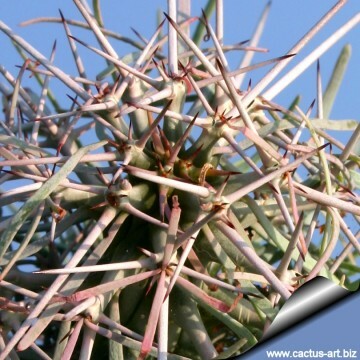 Description: It is a spiny, succulent thorn-bush tree which can reach 4 to 6 meters. 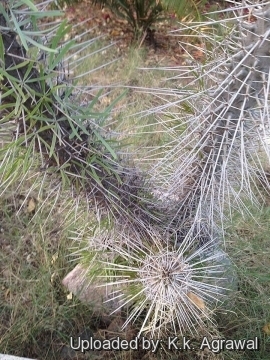 These hardy drought-resistant plants appear as a spine-encrusted mass of branches. 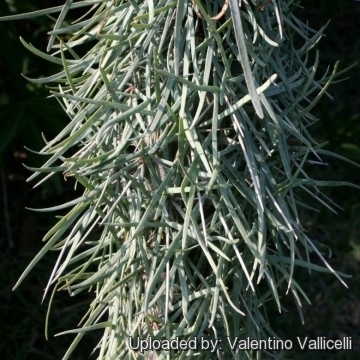 Leaves: Greyish-green strip-like and deciduous. 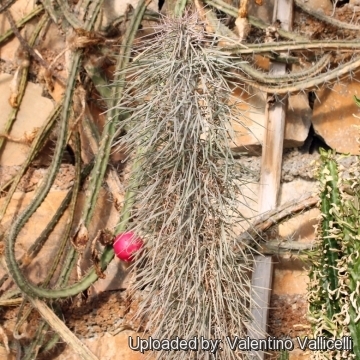 Remarks: This plant is an example of convergent evolution. 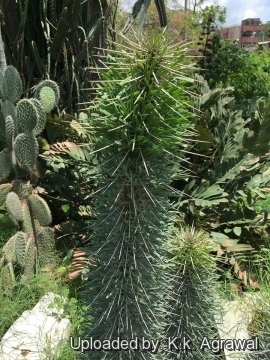 In fact both New World cacti, African Euphorbias and the Madagascar Didiera madagascariensis appear similar in appearance, being succulent, spiny, water-storing, and adapted to desert conditions. However, they are classified in separate and distinct families, sharing characteristics that have evolved independently in response to similar environmental challenges, and hence this is a typical case of convergence. 5) Couzens, Dominic (2008). "Top 100 Birding Sites of the World." Berkeley, California: University of California Press. p. 166. ISBN 0-520-25932-7. 6) Baillon, Henri Ernest (1880). "Sur le Didierra". Bulletin Mensuel de la Société Linnéenne de Paris (in French): 258–259. 7) Dixon, R. (1995). "The Didiereaceae of southern Madagascar". 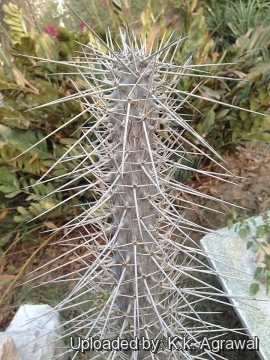 Aloe 32 (3/4): 72–73. ISSN 0002-6301. 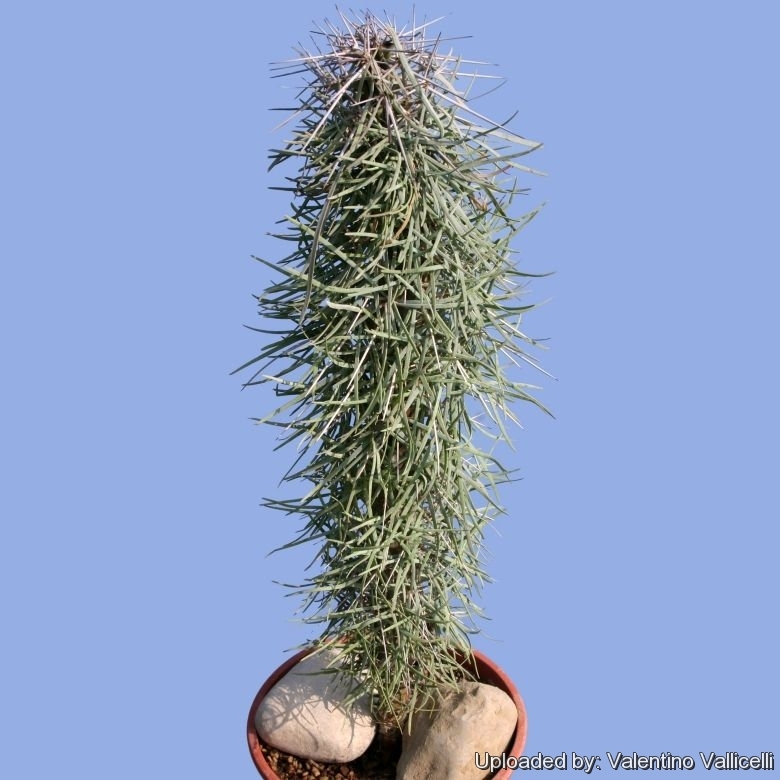 Cultivation and Propagation: This plant can take a good deal of water during active growth and should be watered only when not dormant. Keep dryish in winter. 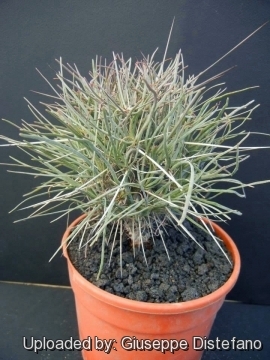 This plant should be overwintered in the greenhouse at temperatures over 12°C (avoid to let temperatures to drop lower than 5° C) Use a very draining but rich soil, and not too much sun. Propagation: Can be reproduced both by seeds or grafting it on Allaudia procera. The seedlings look like pine seedlings (stem, tiny bunch of leaves).